Children are our most precious assets. They represent our best hopes for the future. They are filled with potential, dreams, imagination and love. It is the responsibility of adults to ensure their safety, their protection, their access to health care and education. It is up to adults to provide our most precious with hope, compassion and a better future. 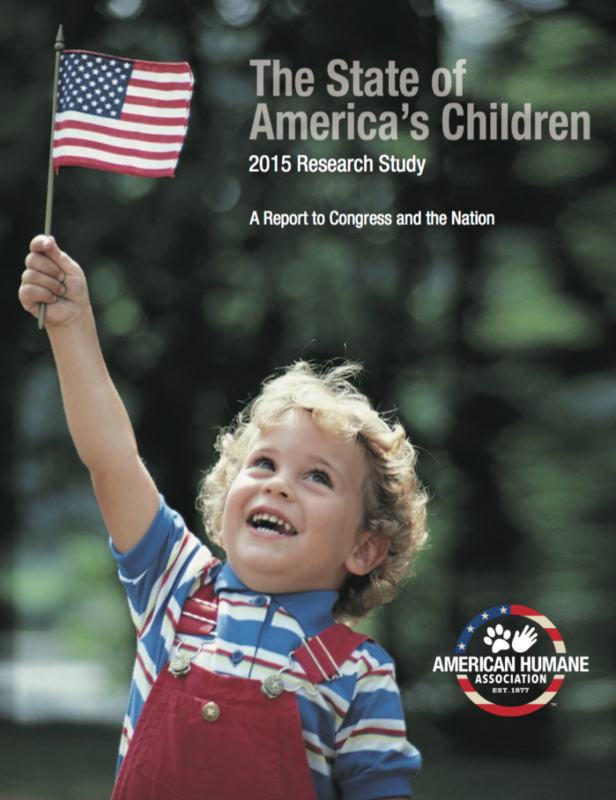 American Humane has been at the forefront of the protections for our country’s children for generations. It was in 1878 that child safety and protection concerns became part of our national agenda. We championed child labor laws in 1909; advocated for safe playgrounds in 1914; created national standards for defining child abuse in 1950; proposed that all fifty states pass laws requiring reporting of child abuse in 1963; testified in support of Child Abuse Prevention and Treatment Act in 1973; urged the establishment of the U.S. House Select Committee on Children, Youth and Families in 1983; and advanced the areas of differential response and family group decision-making in the 1990s. In recent years, American Humane has launched innovative research and programs helping children with cancer, children of military families, and others in need. American Humane launched the Children’s Innovation Institute in 2012, bringing together senior fellows in research to examine the key issues and challenges facing today’s children. The State of America’s Children research study is an in-depth qualitative exploration of adults’ perceptions of the threats facing children. We hope that this research will advance our collective knowledge and provide for a productive dialogue on how we can build a more humane world for our children.